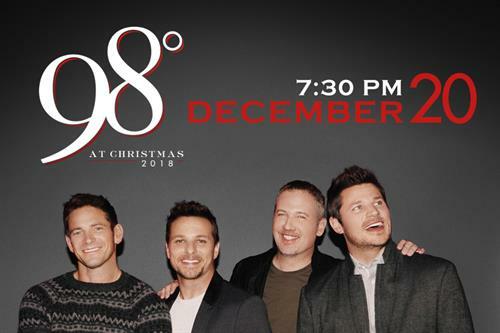 98°, the Billboard chart-topping boy band, who have sold more than 10 million records worldwide, will bring their holiday album, Let It Snow, to the Rialto Square Theatre on Thursday, December 20th 2018. In 2001, the all-Ohio-raised quartet decided to take a break. Their sold out tours in 2013 and 2016 proved a demand for 98° so when the timing was right with the band’s schedules, they recorded and released their first full-length Christmas album in 18 years, Let It Snow. Tickets go on sale to the general public May 25, 2018 at 10:00 AM. Go to https://rialtosquare.com or call Ticketmaster at 800-745-3000 for tickets.